As the leader of a homeless services center – and former homeless drug user – Mike Johnson knows it’s crucial to have help available when someone wants to get off the streets. But when a homeless person in Sonoma County says “I’m ready,” those services often aren’t there. There aren’t enough emergency beds, temporary living spaces or permanent affordable housing for the estimated 4,300 homeless residents. “The bottleneck is both at the front end and at the back end,” said Johnson, the executive director of the Committee on the Shelterless, or COTS, in Petaluma. 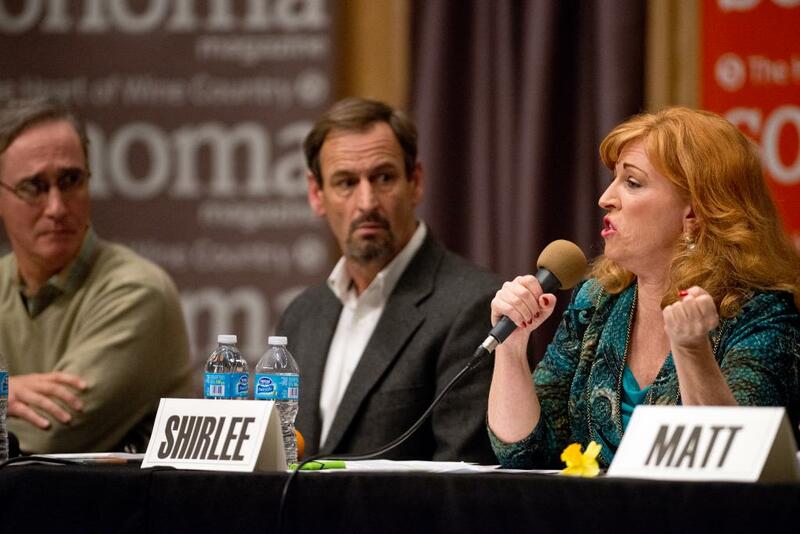 Johnson was among several community leaders to participate in a panel discussion Wednesday night on the causes and impacts of homelessness in Sonoma County in a forum presented by The Press Democrat and Sonoma Magazine. The “Shine A Light” discussion, before a packed house at the Glaser Center in downtown Santa Rosa, is the first of an occasional series of forums on community issues, Press Democrat Executive Editor Catherine Barnett said. The forum was prompted by an illuminating Sonoma Magazine article, written by Press Democrat Staff Writer Jeremy Hay, that chronicled the lives of several young people living on the streets of Santa Rosa. The experts discussed difficulties assisting the estimated 10,000 people who are homeless at some point in a given year in Sonoma County. A one-day census of the homeless population counted 4,280 homeless residents, 1,128 of whom were under age 24 and 277 under age 18. The waiting list for housing at the COTS Mary Isaak Center in Petaluma is eight weeks, Johnson said. The answer to a person in urgent need is: “Stand in line for two months. Sorry. We can’t help you for two months,” he said. The picture is equally as dire on the other end of the continuum: Burbank Housing operates about 2,800 affordable housing units in Sonoma County. The waiting list is now at 7,400 applicants. Jennielynn Holmes, director of shelter and housing for Catholic Charities, spoke of a family who recently became homeless for the first time. The mother, father and their 14-year-old daughter are living in the family’s truck under the new “safe parking” program at the county fairgrounds, which allows as many as 50 vehicles on site this winter. That sentiment was echoed by others on the panel, including Chuck Cornell, executive director of Burbank Housing, Matt Martin, the executive director of Social Advocates for Youth and Sonoma County Supervisor Shirlee Zane. Acting Santa Rosa Police Chief Hank Schreeder spoke of the combination of homelessness, substance abuse and mental illness that leads to police intervention when it affects the quality of life of others. “Contrary to popular belief, the police can’t solve homelessness and the jail is not a shelter,” he said. Zane and Cornell advocated for more affordable housing units, while others urged “systems of care” that treat the causes of a person’s homelessness and support them through to permanent housing. Shadowing the discussion was disagreement about SAY’s Dream Center in Bennett Valley, a controversial proposal to create a 63-bed transitional housing facility for homeless youths and those who have aged out of foster care. You can reach Staff Writer Lori A. Carter at 762-7297 or lori.carter@pressdemocrat.com.